Welcome to my first official posted workout. There are plenty more where this came from! I will be releasing two more stick workouts after this, one next week and one the week after. So stop back here and feel free to Pin away. After than, I hope to continue developing even more workouts to share with you all. So, this first installment is a full-body stretch workout. Print the poster and use the descriptions below to perform your stretch workout. 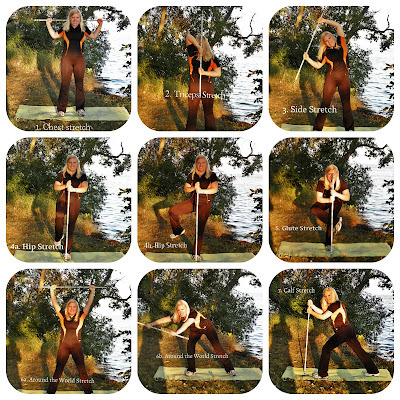 I have taken my inspiration for these workouts from those broomstick workouts that you might notice in magazines, etc. I shared the Workout Stick DIY tutorial last week, so if you want to personalize this workout to your unique style, check that DIY project here! Otherwise, feel free to grab an actual broomstick from your closet or even a thick straight stick from your backyard. Always remember that a gentle stretch is good, but discontinue any moves that actually hurt. 1. Chest Stretch: With a wide grasp on your workout stick, pull the stick up and behind your head until you feel a slight stretch in your chest muscles. Go deeper if your body allows. The stick itself allows you to go deeper into this stretch than your body could alone. Hold the stretch for 30 seconds. 2. Triceps Stretch: Reach behind your back and grasp the stick, one hand from below the shoulder and one from above. "Walk" your hands closer to each other to go deeper into the stretch. Hold for 30 seconds. Switch sides and repeat. 3. Side Stretch: With a wide grasp, hold the pole over your head. Now lean to the right until you feel a stretch in the side body. Hold for two counts. Slowly return to the top and repeat on the other side. Do 8 repetitions each way. 4. Hip Stretch: Using your stick for balance straight out in front of you, (a) raise your right knee to hip height, (b) then rotate out to the side and return it to the ground. Continue in a circular motion for 10 reps. Switch sides and repeat. 5. Glute Stretch: Using your workout stick for balance, sit back into a squat bringing the right ankle over your left knee. Sit back into the stretch. Hold for 30 seconds. Switch sides and repeat. 6. Around the World Stretch: (a) With a wide grasp, hold the pole over your head. (b) In a circular motion, move the stick around to your right, down toward the floor and then up toward the left. Do 4 circles this way and 4 circles in the opposite direction. 7. Calf Stretch: Using your stick for balance, step back into a rear lunge with the right foot, toes pointed forward and front leg bent. Press the right heel toward the floor until you feel a good stretch. Hold for 30 seconds and repeat on the opposite side. Stretching is so important to do before and after your workouts. It's an often overlooked and often skipped-over portion of a workout, especially in the face of time constraints. But by skipping stretching, you're really missing out and robbing your body of some really great benefits! Flexibility helps with everything from proper mechanics to balance to posture and so many things in between. I would especially emphasize performing a stretching routine like this after exercise, while muscles are all warm and receptive to stretching. Check back next week for your first of two total-body strength routines using your new workout stick! P.P.S. : Disclaimer: I am an NASM-certified personal trainer, however I cannot be with you in person to assess, check your form and guide you, so please remember that these workouts are done at your own risk. As always, check with your doctor before beginning this or any other exercise program and always honor your body's abilities and limitations.